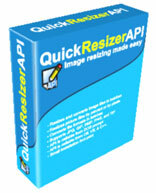 QuickResizerAPI (QuickResizer Application Program Interface) resizes and converts image files in batches. It is a convenient tool to quickly shrink your picture files to a smaller size before sending them via email or posting them on the Web. It saves you time from having to open each file individually in a graphic software, resize it, and then save it. You can choose to resize your picture files by percent or by width and height. You can also convert the file formats in batches. Formats available are: JPG, GIF, BMP, PNG, and TIF. QuickResizerAPI is a tool for advance users and programmers. It extends the functionalities of QuickResizer. It has all the features that QuickResizer has plus more. QuickResizerAPI is callable by any .Net languages (C#, VB .Net, Managed C++, etc). It can also be called from DOS. QuickResizerAPI has a very simple interface and it can generate sample code for you. QuickResizerAPI has a relatively small installation zip file (only 0.3 MB in file size), it can be downloaded quickly from our QuickResizerAPI Download page. QuickResizerAPI runs on Windows 98, ME, NT 4.0, 2000, XP, and Vista. For detailed instructions on how to install and run QuickResizerAPI, please click on the QuickResizerAPI User's Guide link. The unregistered version of QuickResizerAPI allows you to resize/convert up to 20 images. If you would like to purchase a license after trying it, you can make your purchase by clicking on the QuickResizerAPI Buy Now link. You will get unlimited e-mail tech support from us after your purchase. QuickResizerAPI has been awarded "100% CLEAN" Award by Softpedia. Softpedia guarantees that QuickResizerAPI is 100% CLEAN, which means it does not contain any form of malware (spyware, viruses, trojans, backdoors, etc).